"Iniya Deepavali Vaazhthukkal" - "A Very Happy Deepavali"
Finally I am home after a 8 day trip to Scotland with my family and friends. We had such a fun time that no one even noticed how fast those 7 days went. We were a gang of 11 along with 5 kids ranging from 4 yrs to 5 months of age. The highlight of the trip was that we got to celebrate 3 birthdays in a row, one after the other. My friend's daughters, Maya and Meera's birthdays were on 20th and 23rd and my daughter's b'day was on 21st. It was so lovely to see the kids enjoy the balloons, party hats, cake and music with such zeal that even we adults got into the party mood. I really didn't want to come back to reality but you can't escape for a long time, can you? I didn't want to miss posting something before Deepavali. How can I ? Deepavali , "The Festival of Lights" holds so much meaning for anyone who is from India. That doesn't mean the festival must not be celebrated by others, everyone is welcome to join the celebration. 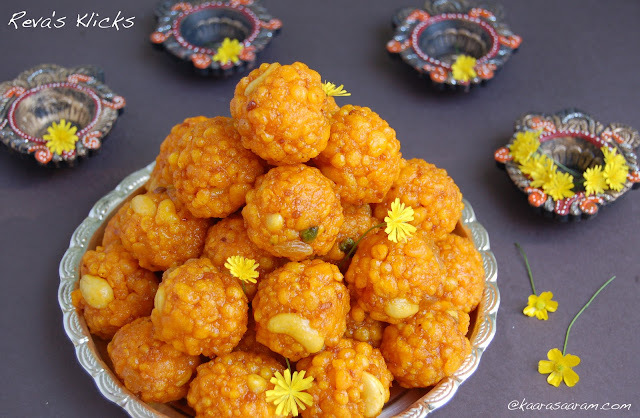 Bhoondhi laddoo is a very simple sweet. All you need is a little patience to make them. During my last visit to India, one of my aunts mentioned that adding rice flour to the kadalai maavu makes the boondhi hold its shape more firmly. This is my second attempt to make them , so you see some imperfections in the laddoos as the boondhis are of various sizes. Small plate / laddle / tablespoon : 1 each [optional and additional]. Cardamon powder: 1 large pinch. Bicarbonate of soda: 1 large pinch. 1.Heat oil in a heavy bottomed - wide mouthed vessel. 2.Mix all the above ingredients except the milk and water. 3.First add the milk and mix well. Next add the water little by little until you get "drip consistency" [see notes]. 4. Check wether the oil is hot enough [see notes]. 5.Hold the boondhi karandi right above the oil with your left hand. With your right hand pour a small ladle of the above mixture on the bhoondhi karandi. 6. Gently tap the bhoondhi karandi with the smaller laddle which is in your right hand, all the time moving you left hand in a circular motion over the oil [see notes]. 7.Scoop the fried bhoondhis with another clean laddle and collect in a vessel lined with kitchen towel. 8.Continue the process until all the maavu is used up. Pachai karpooram [optional]: 1 small pinch. 1.Place a heavy bottom wide mouthed vessel on medium flame and add the sugar and water. 2.Stir gently until all the sugar is dissolved. Add the milk. You will see the scum and dirt [if any] float on top of the sugar mix. 3.Remove this with a spoon and continue to simmer the sugar syrup until thick and sticky. 4.Add the pachai karpooram and food colour. Mix well. Remove from flame and keep warm. Cashews / raisins / pistachios:each 2 tbsp. 1.Fry the cashews, raisins and pistachios in ghee, add to the fried bhoondhis and mix well. 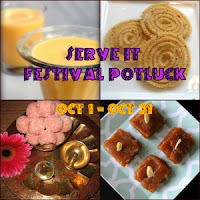 2.Pour 2-3 ladles of the sugar syrup to the bhoondhis and mix gently until all the bhoondhis are coated with sugar syrup. Let it sit for 5 minutes. 3.Again pour 2-3 ladles of the syrup and mix gently. Let it rest for 5 minutes. 4.Check the bhoondhis, they should be soft. When you press the bhoondhis in-between your finger tips, a little syrup should come from the bhoondhis but they should hold their shape and not disintergrate. This is the right consistency. 5.If they are a little dry , add 1-2 laddles of syrup and wait for 5 minutes. Test the bhoondhis as above. 6.If the consistency is right, proceed to make laddoos. 7.Take a small amount of the sugar soaked bhoondhis in your hand and make keep rolling to form a soft round ball. 8.Place all the laddoos in large tray and keep the tray in a airy place for a couple of hours. Once the laddoos have dried and firmed up, store in air tight containers. 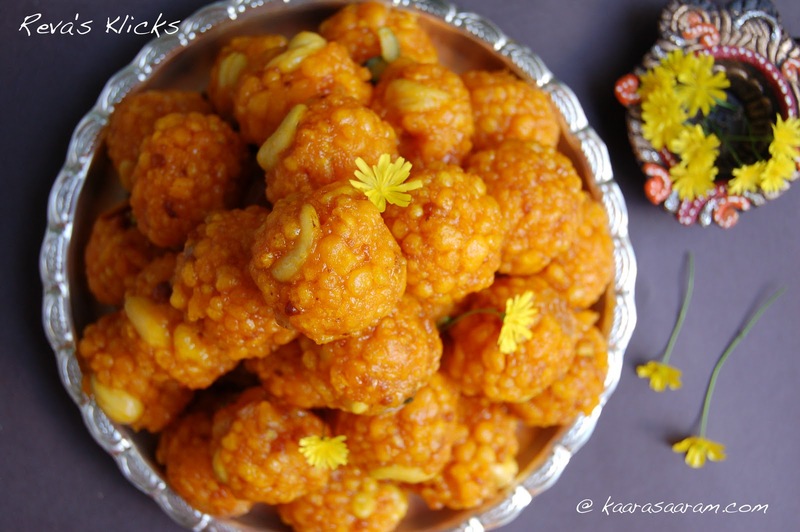 This tastes best when eaten within a couple of days but you can store the laddoos in the refrigerator for longer. Notes: Be very careful when adding the syrup. It is always better to add small amounts slowly and check for the right consistency. If you have some syrup left over, store it in air tight container. You can use the same syrup for preparing jeera poori, badhushas etc. Just reheat the syrup gently and use as given in the recipe. "Drip Consistency" - pour some of the liquid mix on the bhoondhi karandhi, if the mix drips freely in the form of tiny droplets when you tap, then the consistency is right. If too thick, add a little water and check consistency. If too watery and thin, add 2-3 tbsp of kadalai maavu [besan flour]. "Temperature of Oil": Drop a tiny droplet of the mix into the oil. If it comes to the surface immediately without becoming too dark, then the temperature is right. If the droplet stays at the bottom of the oil, then the oil is low in temperature. If the droplet becomes too dark quickly, then the oil is very hot. Reduce the flame for some time. Check the temperature before frying the bhoondhis. "Circular motion for frying bhoondhis": Move the bhoondhi karandhi over the oil in a circular motion as you would when making a dosa - smooth circular motion. This helps the bhoondhis to fall all over the oil and fry evenly and quickly. Other wise they will fall in the same place and clump together. 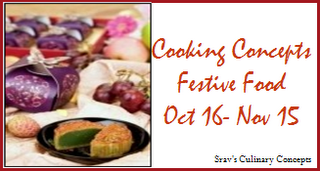 Cooking Concept : Festive Food by Sravani. Ladoos look stupendously delightful and mouthwatering. A Very Happy Diwali to you and your dear ones. 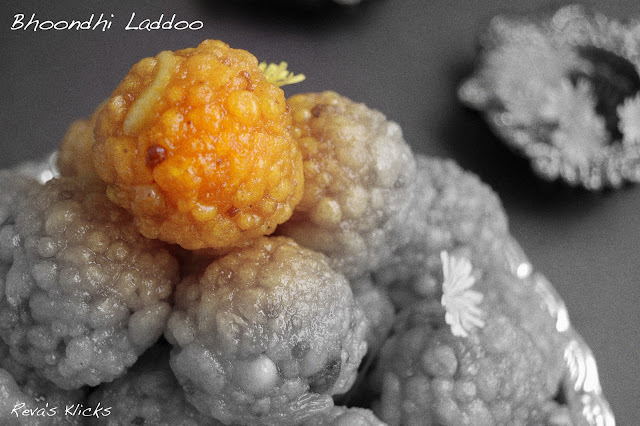 Awesome no words to these perfectly made ladoos.. 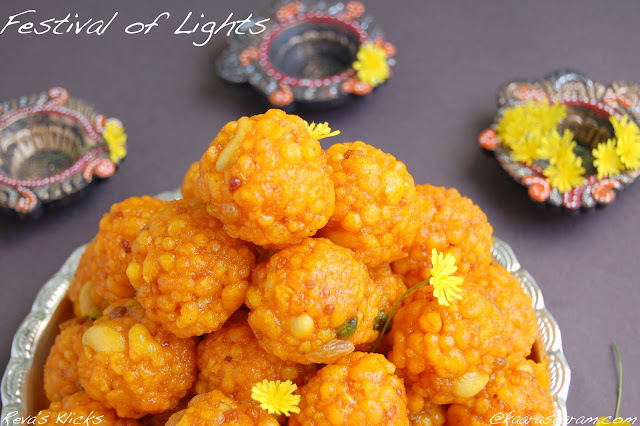 Happy Diwali ..
Wishing you and your family a very happy diwali..
Laddu luks yum yum and vibrantly delicious.Nice to hear that U have one more Christy there as friend. Boondi Ladoo is my altime fav, though have never tried it myself to create.. Lovely family picture of urs. Happy Diwali! awesome clicks Reva. great that you all are having fun together.wish you a very happy diwali. 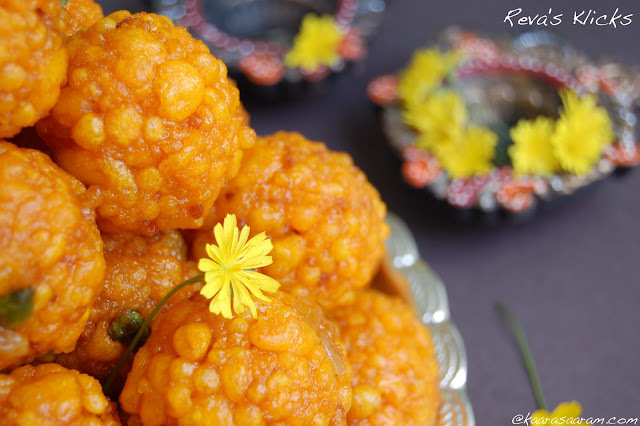 awesome reva...looks so perfect n delicious...wonderful presentation...wish you a very happy diwali !!! 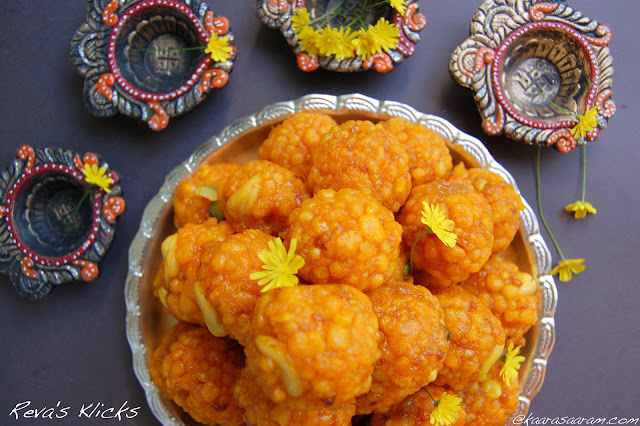 Awesome laddus and colourful presentation. Happy Diwali to you and your family. Ladoo looks delicious,Wish u and ur family a happy and joyful Diwali. Happy Diwali Reva. Laddus are awesome and thanks for sending.. Mind blowing pics dear. 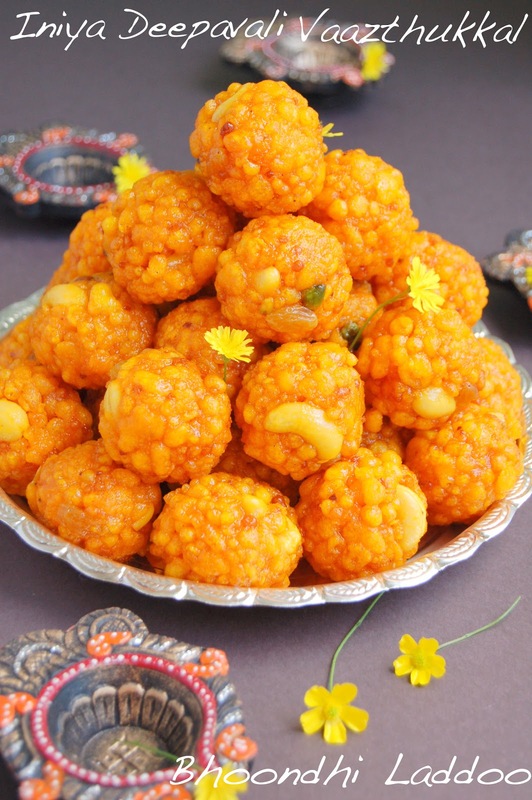 Amazing colour of laddoos. I loved the cute flowers in between. BTW a very happy Diwali. 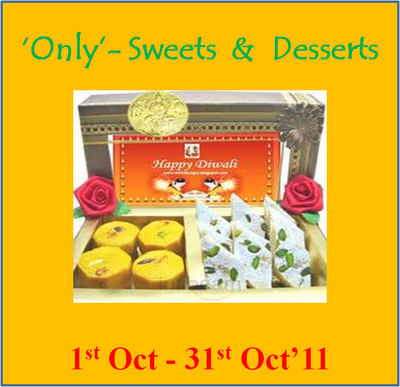 Wish you and your family a very happy and prosperous Diwali. 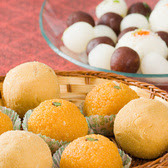 Laddoos looks fabulous, yummy and tempting. Wishing you and your family to Very Happy Diwali. Very lovely presentation. 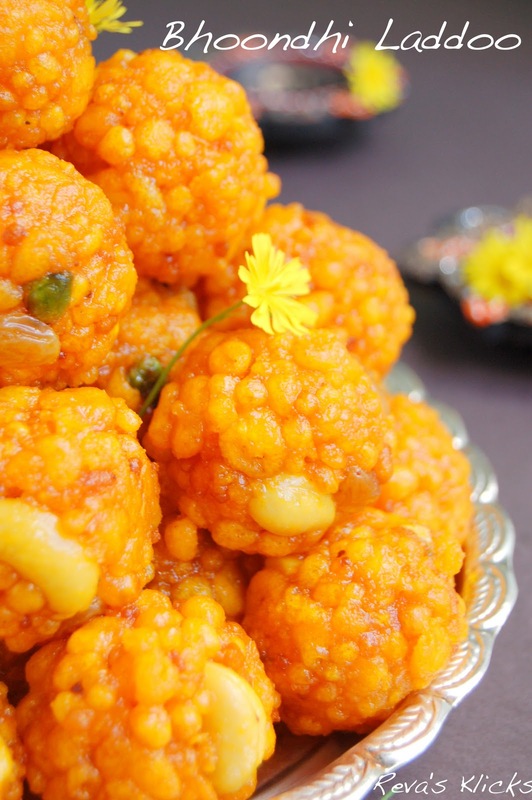 Laddu looks delicious, glad to hear that you had fun visiting Scotland. Wishing you and family a happy and prosperous Diwali. ohh boy!!!! wat a laddo...jus simply love it..looks awesome..
& Wish you a Happy Diwali!!!! 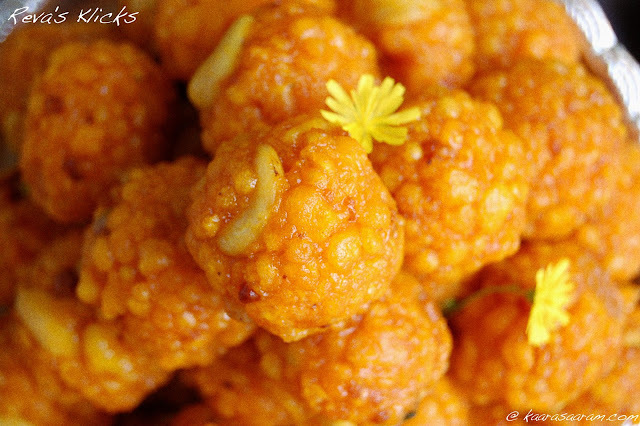 Ladoos are looking gorgeous & super moist. 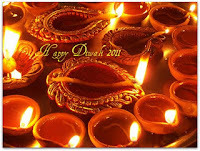 Happy Deepavali to u and ur family! beautiful and perfect ladoo...lovely clicks and presentation..
Hey reva, hope you had a great diwali and the ladoos rock! pics are so goooooooood! Woww seems u had a great time Reva, am jealous dear, laddoos looks fantastic and cute. They look more than perfect ~ round n moist n super scrummy! Great work my dear! U deserve such escapes...Luv the ladoos with floral notice...Hope u had wonderful diwali with ur family..
Hi Reva,superb laddoos! Got too tempted and tried making them for the 1st time. Came out very well! Thanks for the motivation! ;) Hope you had a nice Diwali too! 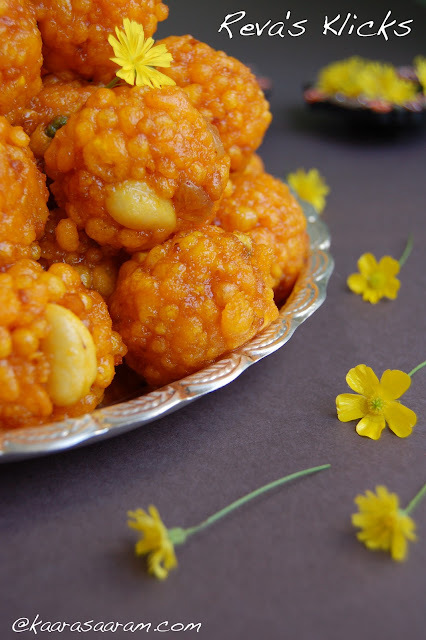 wow... beautiful pics and delicious looking laddooos..
your ladoo look so inviting, my 2 yrs son love motichoor ladoo, i have been tying to make this with my ordinary laddle which we use for taking out fried item. Hello Anonymous - Sorry I don't know your name. Usually the sugar syrup is boiled until it attains "one string" consistency - that is when you touch the syrup with your index finger and press against your thumb and seperate the two fingers, you will see a string being formed. For this recipe I made the syrup sticky and thick - simmering the syrup for 10 minutes or so. You can have the syrup just thick or boil it to one string consistency. For the bhoondhi - Once they fall into the oil they would pop up and sizzles for a couple of seconds. Remove them once the sizzling subsides. Even if they are a little crisp, it doesn't matter. The important thing is the temperature of the oil should be right. If it is too hot , then the bhoondhis will become dark brown and will not taste good. If it is cold, then the bhoondhis will not fry quickly.They will soak up a lot of oil and will be soggy. It will be very nice to know your name..
thanks a lot for your immediate reply, I tried it today but result was not so happy, i think the boondi didn't soak up the sugar syrup all the way. Anyway i will try again let u know. My name is bindu from sydney, basically from bangalore.